The earth’s thin rocky outer layer (3–45 mi [5–70 km] thick) is called “the crust.” On the continents it consists of sedimentary rock layers—some containing fossils and some folded and contorted—together with an underlying crystalline rocky basement of granites and metamorphosed sedimentary rocks. In places, the crystalline rocks are exposed at the earth’s surface, usually as a result of erosion. Beneath the crust is what geologists call the mantle, which consists of dense, warm-to-hot (but solid) rock that extends to a depth of 1,800 mi (2,900 km). Below the mantle lies the earth’s core, composed mostly of iron. All but the innermost part of the core is molten (see Figure 1). Investigations of the earth’s surface have revealed that it has been divided globally by past geologic processes into what today is a mosaic of rigid blocks called “plates.” Observations indicate that these plates have moved large distances relative to one another in the past and that they are still moving very slowly today. The word “tectonics” has to do with earth movements; so the study of the movements and interactions among these plates is called “plate tectonics.” Because almost all the plate motions occurred in the past, plate tectonics is, strictly speaking, an interpretation, model, or theoretical description of what geologists envisage happened to these plates through earth’s history. Figure 1. Cross-sectional view through the earth. The two major divisions of the planet are its mantle, made of silicate rock, and its core, comprised mostly of iron. Portions of the surface covered with a low-density layer of continental crust represent the continents. Lithospheric plates at the surface, which include the crust and part of the upper mantle, move laterally over the asthenosphere. The asthenosphere is hot and also weak because of the presence of water within its constituent minerals. Oceanic lithosphere, which lacks the continental crust, is chemically similar on average to the underlying mantle. Because oceanic lithosphere is substantially cooler, its density is higher, and it therefore has an ability to sink into the mantle below. 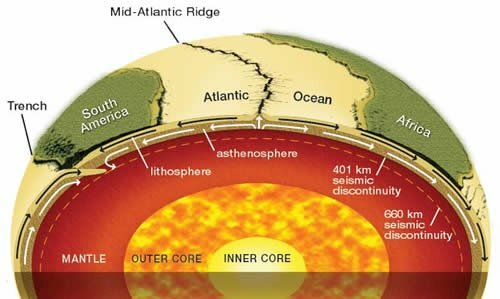 The sliding of an oceanic plate into the mantle is known as “subduction,” as shown here beneath South America. As two plates pull apart at a mid-ocean ridge, material from the asthenosphere rises to fill the gap, and some of this material melts to produce basaltic lava to form new oceanic crust on the ocean floor. The continental regions do not participate in the subduction process because of the buoyancy of the continental crust. Extension occurs where the seafloor is being pulled apart or split along rift zones, such as along the axes of the Mid-Atlantic Ridge and the East Pacific Rise. This is often called “seafloor spreading,” which occurs where two oceanic plates move away from each other horizontally, with new molten material from the mantle beneath rising between them to form new oceanic crust. Similar extensional splitting of a continental crustal plate can also occur, such as along the East African Rift Zone. Transform faulting occurs where one plate is sliding horizontally past another, such as along the well-known San Andreas Fault of California. Compressional deformation occurs where two plates move toward one another. If an oceanic crustal plate is moving toward an adjacent continental crustal plate, then the former will usually subduct (plunge) beneath the latter. Examples are the Pacific and Cocos Plates that are subducting beneath Japan and South America, respectively. When two continental crustal plates collide, the compressional deformation usually crumples the rock in the collision zone to produce a mountain range. For example, the Indian-Australian Plate has collided with the Eurasian Plate to form the Himalayas. The idea that the continents had drifted apart was first suggested by a creationist, Antonio Snider.2 He observed from the statement in Genesis 1:9–10 about God’s gathering together the seas into one place that at that point in earth history there may have been only a single landmass. He also noticed the close fit of the coastlines of western Africa and eastern South America. So he proposed that the breakup of that supercontinent with subsequent horizontal movements of the new continents to their present positions occurred catastrophically during the Flood. He observed from Genesis 1:9-10 that at that point in earth history there may have been only a single landmass. However, his theory went unnoticed, perhaps because Darwin’s book, which was published the same year, drew so much fanfare. The year 1859 was a bad year for attention to be given to any other new scientific theory, especially one that supported a biblical view of earth history. And it also didn’t help that Snider published his book in French. It wasn’t until the early twentieth century that the theory of continental drift was acknowledged by the scientific community, through a book by Alfred Wegener, a German meteorologist.3 However, for almost 50 years the overwhelming majority of geologists spurned the theory, primarily because a handful of seismologists claimed the strength of the mantle rock was too high to allow continents to drift in the manner Wegener had proposed. Their estimates of mantle rock strength were derived from the way seismic waves behave as they traveled through the earth at that time. For this half-century the majority of geologists maintained that continents were stationary, and they accused the handful of colleagues who promoted the drift concept of indulging in pseudo-scientific fantasy that violated basic principles of physics. Today that persuasion has been reversed—plate tectonics, incorporating continental drift, is the ruling perspective. Determining very accurately the location of earthquakes using a worldwide network of seismometers. The location of mountain belts at or adjacent to convergent plate boundaries (where the plates are colliding). On the other hand, many other observations are incompatible with slow-and-gradual plate tectonics. While the seafloor surface is relatively smooth, zebra-stripe magnetic patterns are obtained when the ship-towed instrument (magnetometer) observations average over mile-sized patches. Drilling into the oceanic crust of the mid-ocean ridges has also revealed that those smooth patterns are not present at depth in the actual rocks.7 Instead, the magnetic polarity changes rapidly and erratically down the drill-holes. This is contrary to what would be expected with slow-and-gradual formation of the new oceanic crust accompanied by slow magnetic reversals. But it is just what is expected with extremely rapid formation of new oceanic crust and rapid magnetic reversal during the flood, when rapid cooling of the new crust occurred in a highly nonuniform manner because of the chaotic interaction with ocean water. Furthermore, slow-and-gradual subduction should have resulted in the sediments on the floors of the trenches being compressed, deformed, and thrust-faulted, yet the floors of the Peru-Chile and East Aleutian Trenches are covered with soft, flat-lying sediments devoid of compressional structures.8 These observations are consistent, however, with extremely rapid subduction during the Flood, followed by extremely slow plate velocities as the floodwaters retreated from the continents and filled the trenches with sediment. The rapidly sinking ocean-floor slabs forcibly displace the softer mantle rock into which they are subducted, which causes large-scale convectional flow throughout the entire mantle. The hot mantle rock displaced by these subducting slabs wells up elsewhere to complete the flow cycle, and in particular rises into the seafloor rift zones to form new ocean floor. Reaching the surface of the ocean floor, this hot mantle material vaporizes huge volumes of ocean water with which it comes into contact to produce a linear curtain of supersonic steam jets along the entire 43,500 miles (70,000 km) of the seafloor rift zones stretching around the globe (perhaps the “fountains of the great deep” of Genesis 7:11 and Genesis 8:2 ). These supersonic steam jets capture large amounts of liquid water as they “shoot” up through the ocean above the seafloor where they form. This water is catapulted high above the earth and then falls back to the surface as intense global rain (“and the floodgates of heaven were opened”). The rain persisted for “40 days and nights” ( Genesis 7:11–12 ) until all the pre-Flood ocean floor had been subducted. Figure 2(a). Snapshot of 3-D modeling solution after 15 days. The upper plot is an equal area projection of a spherical mantle surface 40 mi (65 km) below the earth’s surface in which color denotes absolute temperature. Arrows denote velocities in the plane of the cross-section. The dark lines denote plate boundaries where continental crust is present or boundaries between continent and ocean where both exist on the same plate. The lower plot is an equatorial cross-section in which the grayscale denotes temperature deviation from the average at a given depth. This catastrophic plate tectonics model for earth history16 is able to explain geologic data that slow-and-gradual plate tectonics over many millions of years cannot. For example, the new rapidly formed ocean floor would have initially been very hot. Thus, being of lower density than the pre-Flood ocean floor, it would have risen some 3,300 ft. (1,000 m) higher than its predecessor, causing a dramatic rise in global sea level. The ocean waters would thus have swept up onto and over the continental land surfaces, carrying vast quantities of sediments and marine organisms with them to form the thick, fossiliferous sedimentary rock layers we now find blanketing large portions of today’s continents. This laterally extensive layer-cake sequence of sedimentary rocks is magnificently exposed, for example, in the Grand Canyon region of the southwestern U.S.17 Slow-and-gradual plate tectonics simply cannot account for such thick, laterally extensive sequences of sedimentary strata containing marine fossils over such vast interior continental areas—areas which are normally well above sea level. This catastrophic plate tectonics model thus provides a powerful explanation for how the cold, rigid crustal plates could have moved thousands of miles over the mantle while the ocean floor subducted. It predicts relatively little plate movement today because the continental “sprint” rapidly decelerated when all the pre-Flood ocean floor had been subducted. Figure 2(b). Snapshot of the modeling solution after 25 days. Grayscale and arrows denote the same quantities as in Figure 2(a). For a detailed explanation of this calculation, see Baumgardner, 2003. Also, we would thus expect the trenches adjacent to the subduction zones today to be filled with undisturbed late-Flood and post-Flood sediments. The model provides a mechanism for the retreat of the floodwaters from off the continents into the new ocean basins, when at the close of the Flood, as plate movements almost stopped, the dominant tectonic forces resulted in vertical earth movements ( Psalm 104:8 ). Plate interactions at plate boundaries during the cataclysm generated mountains, while cooling of the new ocean floor increased its density, which caused it to sink and thus deepen the new ocean basins to receive the retreating floodwaters. Moreover, whether at the current rate of movement—only 4 in (10 cm) per year—the force and energy of the collision between the Indian-Australian and Eurasian Plates could have been sufficient to push up the Himalayas (like two cars colliding, each only traveling at .04 in/h [1 mm/h]) is questionable. In contrast, if the plate movements were measured as feet-per-second, like two cars each traveling at 62 mph (100 km/h), the resulting catastrophic collision would have rapidly buckled rock strata to push up those high mountains. The Bible does not directly mention either continental drift or plate tectonics. However, if the continents were once joined together, as suggested by Genesis 1:9–10 , and are now apart, then the only possibility is continental division and “sprint” during the Flood. Some have suggested this continental division occurred after the Flood during the days of Peleg when “the earth was divided” ( Genesis 10:25 ). However, this Hebrew expression can be also translated to mean “lands being divided among peoples,” which, according to the context, refers to the results of the Tower of Babel judgment. Furthermore, the destruction at the earth’s surface, where people and animals were then living during such a rapid continental “sprint,” would have been as utterly devastating as the Flood itself. Therefore, using catastrophic plate tectonics as a model, mechanism, and framework to describe and understand the Genesis Flood event is far more reasonable and is also consistent with the Bible. Early skepticism about the slow-and-gradual plate tectonics model has largely evaporated because it has such vast explanatory power. When applied to the Flood, however, the catastrophic plate tectonics model not only explains those elements in a more consistent way, but it also provides a powerful explanation for the dramatic evidences of massive flooding and catastrophic geologic processes on the continents. 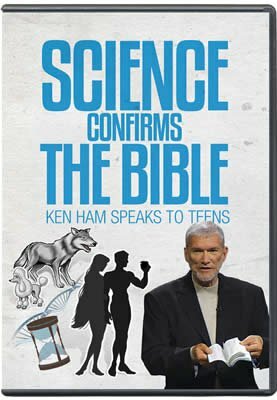 From the late eighteenth century to the present, most scientists, including creationists, rejected the Genesis Flood to explain the fossil-bearing portion of the geological record because it lacked an adequate mechanism to produce such a vast amount of geological change in such a short time. Only now are we beginning to understand at least part of the means God may have used to bring this world-destroying judgment to pass, including catastrophic plate tectonics. 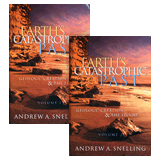 Many creationist geologists now believe the catastrophic plate tectonics concept is very useful as the best explanation for how the Flood event occurred within the biblical framework for earth’s history. Even though the Bible does not specifically mention this concept, it is consistent with the biblical account, which implies an original supercontinent that broke up during the Flood, with the resultant continents obviously then having to move rapidly (“sprint”) into their present positions. This concept is still rather new, and of course radical, but its explanatory power makes it compelling. Additional work is now being done to further detail this geologic model for the Flood event, especially to show that it provides a better explanation for the order and distribution of the fossils and strata globally than the failed slow-and-gradual belief. Of course, future discoveries may require adjustments in our thinking and understanding, but such is the nature of the human scientific enterprise. In contrast, “the word of the Lord endures forever” ( 1 Peter 1:25 ). Previous Chapter Why Don’t We Find Human & Dinosaur Fossils Together? Next Chapter Don’t Creationists Believe Some “Wacky” Things? S.E. Nevins and S.A. Austin, Continental drift, plate tectonics, and the Bible; in D.R. Gish and D.H. Rohrer, eds., Up With Creation! Creation-Life Publishers, San Diego, California, 1978, 173–180. A. Snider, Le Création et ses Mystères Devoilés, Franck and Dentu, Paris, 1859. A. Wegener, Die Entstehung der Kontinente und Ozeane, 1915. A. Co, ed., Plate Tectonics and Geomagnetic Reversals, W.H. Freeman and Co., San Francisco, California, 1973. S.H. Kirby, Rheology of the lithosphere, Reviews of Geophysics and Space Physics 25(1):219–1244, 1983. J. Cann, Subtle minds and mid-ocean ridges. Nature 393:625–627, 1998. J.M. Hall and P.T. Robinson, Deep crustal drilling in the North Atlantic Ocean, Science 204:573–576, 1979. D.W. Scholl et al., Peru-Chile trench sediments and seafloor spreading, Geological Society of America Bulletin 81:1339–1360, 1970; R. Von Huene, Structure of the continental margin and tectonism at the Eastern Aleutian Trench. Geological Society of America Bulletin 83:3613–3626, 1972. S.A. Austin et al., Catastrophic plate tectonics: a global Flood model of earth history; in R.E. Walsh, ed., Proceedings of the Third International Conference on Creationism, Creation Science Fellowship, Pittsburgh, Pennsylvania, pp. 609–621, 1994. J.R. Baumgardner, Numerical simulation of the large-scale tectonic changes accompanying the Flood; in R.E. Walsh, C.L. Brooks, and R.S. Crowell, eds., Proceedings of the First International Conference on Creationism, Vol. 2, Pittsburgh, Pennsylvania, pp. 17–30, 1986; J.R. Baumgardner, 3-D finite element simulation of the global tectonic changes accompanying Noah’s Flood; in R.E. Walsh, C.L. Brooks, and R.S. 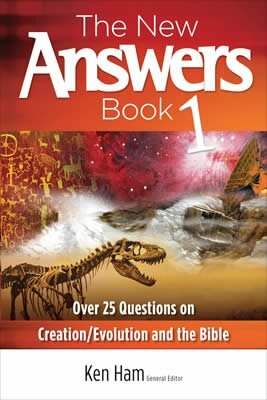 Crowell, eds., Proceedings of the Second International Conference on Creationism, Vol. 2, Creation Science Fellowship, Pittsburgh, Pennsylvania, pp. 35–45, 1990; J.R. Baumgardner, Computer modeling of the large-scale tectonics associated with the Genesis Flood; in R.E. Walsh, ed., Proceedings of the Third International Conference on Creationism, Creation Science Fellowship, Pittsburgh, Pennsylvania, pp. 49–62, 1994; J.R. Baumgardner, Runaway subduction as the driving mechanism for the Genesis Flood, in R.E. Walsh, ed., Proceedings of the Third International Conference on Creationism, Creation Science Fellowship, Pittsburgh, Pennsylvania, pp. 63–75, 1994; J.R. Baumgardner, The physics behind the Flood, in R.L. Ivey, Jr., ed., Proceedings of the Fifth International Conference on Creationism, Creation Science Fellowship, Pittsburgh, Pennsylvania, pp. 113–126, 2003. J. Beard, How a supercontinent went to pieces, New Scientist 137:19, January 16, 1993. S.A. Austin, ed., Grand Canyon: Monument to Catastrophe, Institute for Creation Research, Santee, California, 1994. D.R. 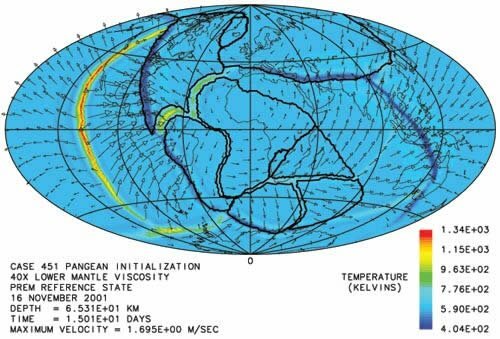 Humphreys, Reversals of the earth’s magnetic field during the Genesis Flood; in R.E. Walsh, C.L. Brooks, and R.S. Crowell, eds., Proceedings of the First International Conference on Creationism, Vol. 2, Creation Science Fellowship, Pittsburgh, Pensylvania, pp. 113–126, 1986. Ibid. ; R.S. 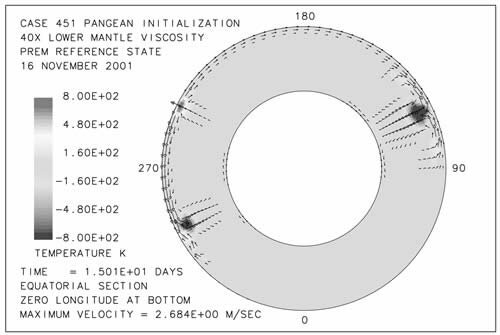 Coe and M. Prévot, Evidence suggesting extremely rapid field variation during a geomagnetic reversal, Earth and Planetary Science Letters 92:292–298, 1989; A.A. Snelling “Fossil” magnetism reveals rapid reversals of the earth’s magnetic field, Creation 13(3):46–50, 1991; R.S. Coe, M. Prévot, and P. Camps, New evidence for extraordinary rapid change of the geomagnetic field during a reversal, Nature 374:687–692, 1995; A.A. Snelling, The “principle of least astonishment”! TJ 9(2):138–139, 1995. P.J. Tackley et al., Effects of an endothermic phase transition at 670 km depth on spherical mantle convection, Nature 361:699–704, 1993; S.A. Weinstein, Catastrophic overturn of the earth’s mantle driven by multiple phase changes and internal heat generation, Geophysical Research Letters 20:101, 104, 1993; L. Moresi and Solomatov, Mantle convection with a brittle lithosphere: thoughts on the global tectonic styles of the earth and Venus, Geophysical Journal International 133:669–682, 1998. S.P. Grand, Mantle shear structure beneath the Americas and surrounding oceans, Journal of Geophysical Research 99:11591–11621, 1994; J.E. Vidale, A snapshot of whole mantle flow, Nature 370:16–17, 1994.